Photo courtesy of AppleInsider reader Vin. As seen in the image above, provided by AppleInsider reader Vin, Apple is advertising free one month trials of its premium iCloud storage plans to Apple device owners not currently paying for a subscription and who have reached their 5GB limit. When these users attempt to perform an iOS device backup, a pop-up message appears promoting the step-up 50GB plan. A similar notification without mention of the free trial has long been part of iOS. "You do not have enough space in iCloud to back up your iPhone. A 50 GB plan gives you plenty of space to continue backing up your iPhone. Your first month is free and it's just $0.99 each month after." Tapping on a large blue button reading "Get 50 GB Free For 1 Month" navigates to "Change Storage Plan" under iCloud settings. The free-to-try options apply to each of Apple's upgrade tiers, ranging from the 50GB rung for $0.99 per month to the 2TB tier for $9.99 per month. As with other Apple subscription services, specifically Apple Music, the selected storage plan will automatically renew at its regular monthly fee once the trial period ends. Users can elect to discontinue services at any time to avoid charges. For now, it appears the promotion is limited to Apple device owners who have not yet upgraded to a premium iCloud tier, as the advertised trial is not showing up for current subscribers. 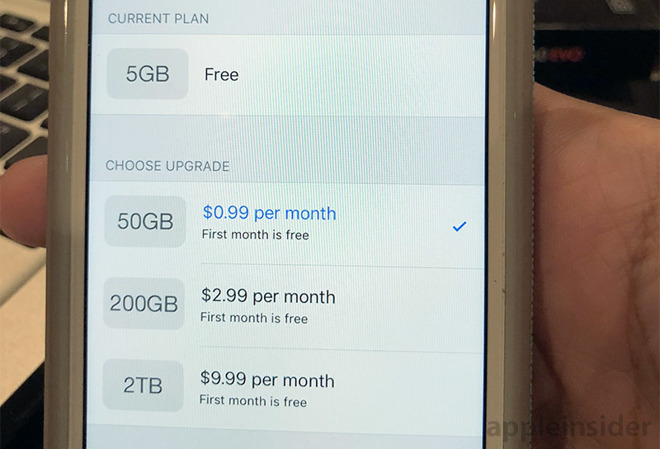 The 5GB tier has been Apple's standard free offering since its introduction in 2014, though premium plan pricing and capacities have changed over the years. Last year, for example, Apple axed a legacy 1TB plan and reduced pricing for its 2TB tier. Most recently, the company introduced family sharing for users subscribed to the 200GB and 2TB tiers, and in March increased free storage for schools to 200GB.